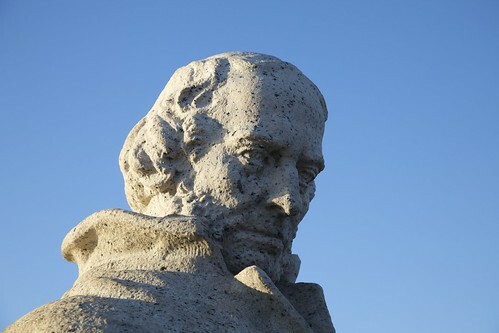 John Ericsson, a Swedish inventor, has a beautiful monument just south of the Lincoln Memorial on the median near the intersection of Ohio Drive SW and Independence Avenue SW. 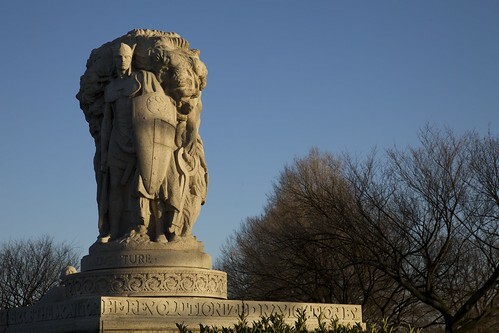 The beautiful pink granite statue was placed on its current location in 1927, at a cost of $60,000. $35,000 of that was federal funds, as voted in by the 1916 Congress, and the other $25,000 was raised through Swedish-American funds. So, why was Ericsson so important? He invented the screw propellor for ships, allowing vessels to propel themselves through the water efficiently using a steam-driven engine. His dual-propeller design is the father of the propulsion system for just about every naval ship in the water today. Ericsson arrived in the United States in 1839 from Great Britain, where he’d been a steam engine designer. While his engine in the Manchester Railway competition had been the faster, it had also been subject to frequent failures, costing them the competition. WIth a grant from President Tyler, Ericsson worked as a team to develop the USS Princeton, a 700-ton steam sloop, with a new propulsion system. While his designs were solid, he would take the blame (unnecessarily, and unfortunately) for the explosion of her secondary gun, killing the Secretary of State and Secretary of the Navy during her trials. Captain Stockton, who designed the gun that exploded, managed to convince the Navy that despite Ericsson’s design on the working guns, the screws, and the rest of the ship, and bar Ericsson from payment. 18 years later, Ericsson would return to the service of the Navy and design one of the most famous ship to bear her name, the USS Monitor. The Monitor, the first of the ironclads, would grant the Union side naval superiority for the Civil War. Ericsson’s inventions would prove to be some of the most valuable to American Naval prowess, and many exist in some form even today. So go check out his nifty memorial over on the south side of the Mall. It’s a bit lonely over there.